Golf is a great way to spend time outside with the family. Golf is one of the oldest and most enjoyed games around. People who love golf come in all ages, from toddlers to 90-year-olds.You get to feel the sunshine on your shoulders while completing a challenge and enjoying a day with friends, or at least others who love the game as much as you do. Golf is just plain fun. Golf courses are generally well kept and beautifully created. Many new courses today are designed to incorporate the surrounding natural elements. The end result is that you feel as though you are walking down a green meadow in the middle of a forest, desert or even a beach. Fresh air and outdoor activity make you feel alive. Regarding exercise, it has been said that you should pick something you enjoy so you will stick with it. Playing golf can be excellent exercise, especially if you forgo the cart and walk. Depending on the course, four or more miles can be walked during 18 holes. When you love the game, it hardly feels like exercise. Lasting friendships can be started and grow right at the golf course. Golfers experience a camaraderie that extends beyond the golf course and into other social situations. If you go to the course alone and join in with other players, by the end of the round you may find yourself having dinner or a beer with new friends while talking about every hole. Golf is a game you can teach your child. When children are young, they enjoy doing just about anything with you. Golf is an opportunity for quality bonding time. 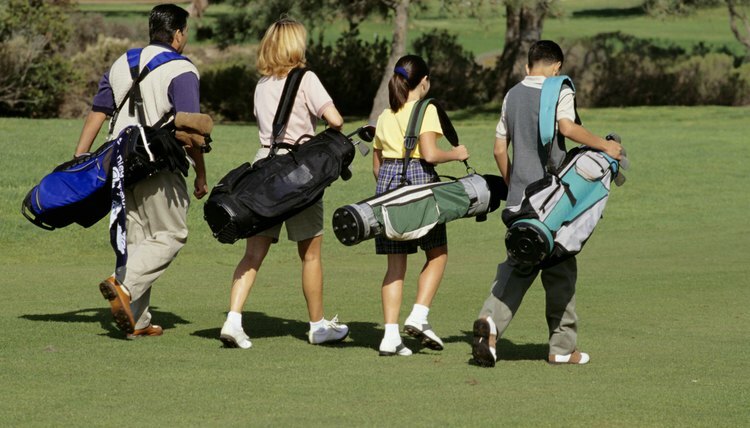 You can take your child (or grandchild) down to the local golf store and purchase clubs that fit her, then head to the course once or twice a month. The experience brings you and your loved ones closer together. Golf offers you a challenge each time you play, at the same course or different ones. You are constantly trying to achieve better scores than before, whether it is on an individual hole or an entire round. And others in your group challenge you to play better. If you are in business or just need to make contacts, the golf course is the perfect place. There is plenty of time between shots or while waiting for the group in front of you to talk about your profession and the strengths of your company. And when that other golfer needs goods and services, he'll likely come to you, someone he already knows and has enjoyed a round of golf with. Playing any sport builds character, but golf provides a chance to be introspective during the process. It's a slower-moving game. When you aren't playing as well as others and become frustrated, you have plenty of time to think about how to handle that frustration. You find a way of coping, and that coping skill spills over into other areas of your life.